The Barnes plasterer was called to this terraced house in Barnes to carry out a plaster repair to a kitchen ceiling which had collapsed following a leak from above. Our professional plasterers removed any old loose plaster & squared up the ceiling hole. Plaster & lath ceilings are seldom level & this one was no exception. This required the Barnes plasterer to level up the ceiling with battens before affixing a piece of plasterboard. 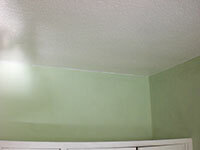 Next a layer of plaster was applied creating a neat ceiling join & a smooth surface ready for painting or wallpapering. As the rest of the ceiling had textured wallpaper a new piece of wallpaper was pasted onto the repair area once the plaster had fully dried out & finally the ceiling was painted. 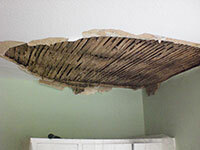 One invisible ceiling repair completed.